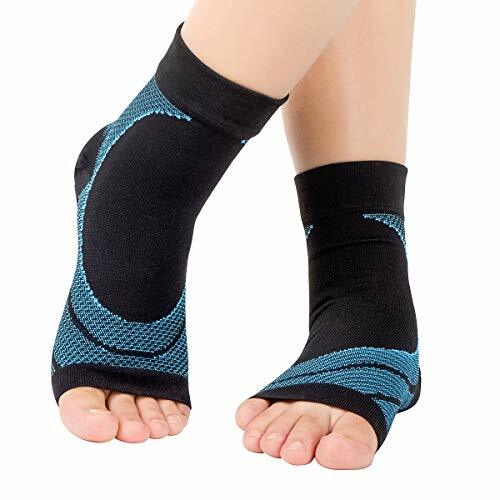 Compression foot sleeves provide instant relief to your arch and heel through compression support that boost your blood circulation. Better oxygen circulation helps reduce lactic acid build up and aids muscle recovery in ankle and feet, including your heel and arch. FDA-registered compression foot sleeves are recommended by doctors and preferred by trainers. The targeted ribbing arch support provides unmatched comfort and pain relief for your feet. Taking reference to sizing chart to get the right size socks. Perforated neoprene for added ventilation and antimicrobial treatment helps control odors. You’ll be able to enjoy exceptional support while still maintaining your peak performance. Comfortable to wear all day! Made from moisture wicking breathable fabric that won’t trap odors, to provide all day relief from plantar fasciitis, foot pain and swelling! For men, women, nurses, maternity, pregnancy, running & heel spur.